Ok first things first! Incase you don't follow us on Twitter or Facebook, we announced the winner of our "Suggest us to your friends" contest. The lucky winner of the $15 gift card is Casey Huber! And for our second announcement, here is the next featured, furry, and adorable card! It is brand spankin new, and titled "Puppy Luv". Each card is hand painted and illustrated by moi, so I will personally make sure every card I create is made purrr-fect for you! (ok, cheezy, I know). 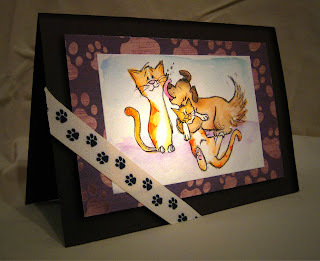 Card's are $15 each an $5 of every card sold will be donated to help the "Humane Society". They are one of the most well known animal protection services in the US. They make sure that our furry friends are treated well, from domestic animals to farm animals and wild animals. You can check out more information about them here. Puppy Luv cards are available now by clicking HERE! Thanks again for everyone's support on our latest contest. Enjoy your week and stay blessed!